Grasmere village is a very pretty and popular tourist destination. It is situated on the River Rothay which flows into Grasmere Lake from where the village takes its name. Surrounded by hills the village is overlooked from the north-west by the rocky hill of Helm Crag also known as “The Lion and the Lamb” or the “Old Lady at the Piano”. These names are derived from the shape of rock formations on its summit depending on which side you view it from. To the east it is overlooked by Heron Pike and Great Rigg on the western ridge of the Fairfield horseshoe. To the south-east by Loughrigg Fell and to the west the long ridge comes down from High Raise. There are a number of walks that start from Grasmere and the village is also on the route of Alfred Wainwright’s Coast to Coast Walk. Grasmere is home to Sarah Nelson’s Gingerbread and the famous Grasmere Gingerbread Shop can be found at Church Cottage tucked away at the corner of St Oswald’s churchyard. Church Cottage which was built in 1630 was originally the village school. William Wordsworth who described the village as “the loveliest spot that man hath ever found” lived in Grasmere for fourteen years. Dove Cottage located on the main road just outside the village was once an inn and became the home of the famous poet William Wordsworth for 8 years in 1799. He married Mary in 1802 and three of his five children were born there. Dove Cottage, the Wordsworth Museum next door and Dove Cottage Garden, which has been restore to the half wild state that William and his sister Dorothy created, are all open to the public. Wordsworth moved to Allan Bank in Grasmere village to accommodate his growing family and finally in 1813 to Rydal Mount in Rydal until his death in 1850. He is buried in St Oswald’s Parish Churchyard alongside his wife Mary, daughter Dora and other family members. Next to the church is a Daffodil Garden in memory of the poet. Grasmere Lake, one of the Lake District’s smaller lakes, is both fed and drained by the River Rothay which rises close to Rough Crag above Dunmail Raise and flows through the village of Grasmere before entering the lake and then exits downstream into Rydal Water then continues south to merge with the River Brathay. The rivers then continue into the northern end of Windermere. The lake containing a single island known simply as The Island is leased by the Lowther Estate to the National Trust. Helm Crag at 405 metres (1,329 feet) sits to the north of Grasmere at the end of a ridge and is recognised by its distinctive summit rocks hence its alternative name ‘The Lion and the Lamb’. The summit has two short parallel ridges and the rocky outcrops at either end of the highest ridge ensures Helm Crag’s name. Only one can be seen from any point in the surrounding valleys and have been named depending on the profile viewed from a particular vantage point. The north-western outcrop is the true summit and a little careful scrambling is needed to stand on the top. 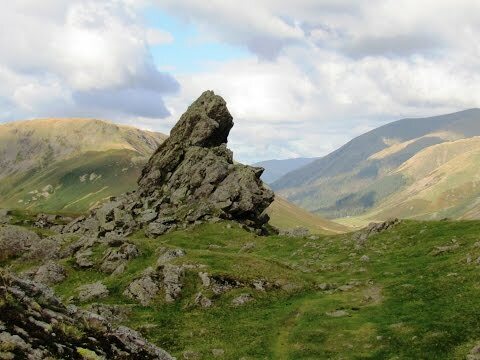 When seen from Mill Gill It is called ‘The Old Lady playing an Organ’ from the summit of Dunmail Raise ‘The Howitzer’ and from a point in between ‘The Lion and the Lamb’ but the southern outcrop prominent from Grasmere is the traditional ‘Lion and the Lamb’. The unusual summit at first seems man-made but is it purely natural and despite its low height it provides wonderful views of the Langdale Pikes, Coniston Fells and Eastern Fells. Helm Crag is usually ascended from Grasmere but can be reached from either valley via Bracken Hause or along the ridge from Gibson Knott. We walk to the end of the car park with the A591 on our right. We cross over the road and go through the gate. We follow the path cross over the bridge and turn left. We head forward following the path until we come to the road at the church in Grasmere. We turn right and follow the road through the village turning left just before the telephone box onto Easedale Road. We head forwards along the road going over a bridge and past a little road coming in from the right. We keep following the tarmac road and when it splits at the signpost Far Easedale and Helm Crag we turn right uphill on a little stony path there is a ‘not for cars’ sign on the side of a building. We go through a gate and bear left. When the path splits we turn right uphill between two walls following the signpost for Helm Crag. At the end of the walls and a big cairn we turn right then start to zigzag steeply uphill. We pass through an old quarry and stop to admire the views from the view point. We keep following the path steeply uphill until it levels out slightly then turn left past the cairn uphill to the top of Helm Crag. We keep following the path and the cairns to the left of the outcrops then drop down to a dip. At the dip we turn right and follow the zigzag path steeply downhill. When we reach the bottom we go through two gates heading towards the bridge over the beck. After crossing the bridge we turn right go through a gate and follow the path towards the stone hut. At the hut we turn left through the gate and at the road we turn right and head forwards along a minor road. At the junction where the road starts to rise just before a bridge we turn right and follow this very quiet road more like a tarmac track to Easedale Road. We now turn left cross over the bridge and retrace our way back into Grasmere and the car park. This is a moderate to hard walk on good tarmac road, gravel, stony and grass paths and tracks. There is a steep incline and decline. Elevation: approx lowest point 66.2m (217.2ft) approx highest point 390.4m (1280.84ft) approx ascent 362.2m (1188.32ft). Approx 5 miles allow 3 hours using OS Explorer Map OL7, The English Lakes South-Eastern area. This walk is clockwise. Start point: lay-by on the A591. Grasmere is located just off the A591 in the Lake District, Cumbria. From the A66 at Threlkeld take the B5322 on the left. At the t-junction at Legburthwaite turn left onto the A591 which runs by the side of Thirlmere. At the roundabout turn right into Grasmere. The pay and display car park is just on the right. The free parking lay-by is on the left before the roundabout. Parking: There are three Pay and Display car parks in Grasmere and limited free road side parking. There is also free lay-by parking on the main A591. There are public toilets in the pay and display car park on the right just before the village and also in the village near the police station. For refreshments in Grasmere there are three pubs the Red Lion, the Wordsworth Hotel and Spar and the Grasmere Hotel plus there are many cafes and other places to eat and drink. There are also plenty of shops to browse round. There are three more pubs nearby on the A591 the Traveller’s Rest, the Swan Inn and the Daffodil Hotel and Spar. The nearest town is Ambleside.